When John was preaching in the wilderness to prepare people for the coming of the Messiah, he was at the same time offering baptism with water to those who came to him as a sign of sincere confession and repentance to their sins. He was willing to offer this kind of baptism to everyone, even to tax collectors and soldiers. But when Jesus Himself came to John for baptism, John immediately tried to deter Him. How did John know that Jesus was the One who came to be a Messiah? It was because John had been filled by the Holy Spirit even from his birth (Luke 1:15). Because of the Spirit’s ministry, John recognized the One who was presenting Himself for baptism. 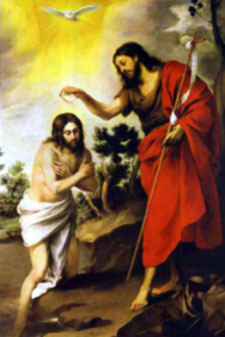 Baptism by John was kind of ritual of cleansing described in the Old Testament – a sign of confession and repentance with a view to forgiveness of sin. And he performed that ritual of cleansing to the people who came to him in order to prepare them to welcome the coming Messiah. But Jesus Christ was sinless; He had no need for repentance or confession. That was one of the reasons John refused to baptize Jesus. John knew that Jesus did not need his baptism. John also recognized that he was unworthy to do the baptizing. Indeed, John saw that he himself needed the baptism from Jesus. As a matter of fact, John had spoken of this baptism in Luke 3:16, “I am baptizing you with water, but one mightier than I is coming. I am not worthy to loosen the thongs of his sandals. He will baptize you with the holy Spirit and fire.” The word of John confessed that he was awaiting the baptism by the Holy Spirit that Messiah will provide. Jesus did not deny John’s statement that He was sinless and did not need John’s baptism. But in response to John’s reluctant attitude, Jesus said, “Allow it now, for thus it is fitting for us to fulfill all righteousness” (Matthew 3:15). If Jesus was the Messiah, then John who was anticipating Messiah’s coming was obligated to submit to His authority. It was this submission in recognition of His identity as Messiah that Jesus required of John. In obedience to the request of Jesus, John baptized Him. But we are still confused about why Jesus needed to be baptized by John? Surely, it was not because Jesus had sin to confess that He needed to come to John. Furthermore, if Jesus had needed John’s baptism, this would have signified that He, like anybody else, was awaiting the coming of the Savior who would forgive sin instead of being the Savior Himself. Thus the Law demanded that one entering into an office should go through a ritual of cleansing. Jesus Christ was inducted into the office of Messiah, not that of priest. But in order to fulfill the demands of the Law, Christ was baptized, signifying that He was consecrated to God and acceptable to Him for service. According to the Gospel of John, we can understand another ground for Christ’s baptism. John the Baptist said, “I did not know him, but the one who sent me to baptize with water told me, ‘On whomever you see the Spirit come down and remain, he is the one who will baptize with the holy Spirit.’ Now I have seen and testified that he is the Son of God” (John 1:33-34). John recognized Jesus as the Messiah when He presented Himself for baptism. But he could not declare this fact by his own subliminal cognition revealed by the Holy Spirit. It was only after the Spirit descended upon Jesus after the baptism that John could make a public announcement that the One whom he had promised had now arrived and had begun His ministry. After this public announcement, Christ’s baptism released John from the task of being the forerunner of the coming of Messiah. In addition, Jesus came to John to obtain baptism so that He might identify Himself with the believing remnant in Israel. John’s ministry had brought men to faith in his word and in the promise of God. This believing remnant was bound together by the sign of John’s baptism. When Jesus Christ came, He came not to identify Himself with a certain social or religious class or a privileged caste, like the Pharisees, the Sadducees, or the Zealots, but rather to identify Himself with the believing remnants who were expecting the fulfillment of God’s promises. Finally, at His baptism Jesus Christ was anointed by the Holy Spirit of God to fulfill the functions of the messianic office. Luke stated, “God anointed Jesus of Nazareth with the holy Spirit and power. He went about doing good and healing all those oppressed by the devil, for God was with him” (Acts 10:38). This anointing for His messianic work took place at Jesus’ baptism. The term Christ means “anointed one.” Jesus was anointed by the Holy Spirit at His baptism and began to fulfill the role of Messiah as described by Isaiah: “The spirit of the Lord God is upon me, because the Lord has anointed me; He has sent me to bring glad tidings to the lowly, to heal the brokenhearted, To proclaim liberty to the captives and release to the prisoners” (Isaiah 61:1).